in the Heavenly Sanctuary by our High Priest —Christ. 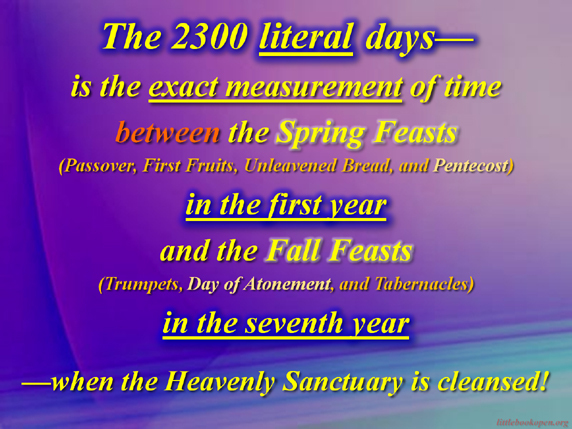 Both the Bible and Ellen White teach that there will be a fulfillment of 2300 literal days as last day events! The antitype fulfillment is the 2300 literal days and will be fulfilled in literal 24-hour “creation days” at the end of the 6,000 years of probation given to man, when these prophecies have their primary and more complete fulfillment in the Last Great Day of Atonement. The Mirror Chart explains these prophecies. The angel Gabriel clearly explains when the complete fulfillment would happen; “Understand, O son of man: for at the time of the end shall be the vision.” “Behold, I will make thee know what shall be in the last end of the indignation: for at the time appointed FS-2 (at the appointed Feast) the end shall be.” “And the vision of the evening and the morning which was told is true: wherefore shut thou up the vision; for it shall be for many days.” Dan 8:17, 19, 26. It will be “at the time of the end” that many will study how the Feasts of the Lord will unlock all the prophecies of the Bible, showing in great detail the last great controversy as our Lord finishes the final acts of atonement in the Heavenly Sanctuary and we see our King coming in the clouds of Heaven. “But thou, O Daniel, shut up the words, and seal the book, even to the time of the end: many shall run to and fro [in the prophecies; in God’s Word], and knowledge [of last-day events] shall be increased.” Dan 12:4 Unfortunately, for many the prophecies explaining the last day events will remain shut up, only because they do not care to study and believe the way the Lord has led in the past. “And he said, Go thy way, Daniel: for the words are closed up and sealed till the time of the end. Many shall be purified, and made white, and tried; but the wicked shall do wickedly: and none of the wicked shall understand; but the wise shall understand. . . . But go thou thy way till the end be: for thou shalt rest, and stand in thy lot at the end of the days.” Dan 12:9, 10, 13. Note: Some people interpret the evening and morning to be the evening and morning sacrifices within the period of light, from sun-up to sun-down, thus they conclude that the length of time intended is not 2300 complete days, but half of that, —1150 days. This cannot be the intended meaning, for the same words are used in Genesis 1 to define a literal day of twenty-four hours! It is as if Daniel, in reality the Mighty Angel standing on the river (Dan 8:16), foresaw this error and went out of His way to make sure that the 2300 day prophecy would retain the true meaning of a day, —twenty-four hours! This of course, doesn’t allow for some of the interpretations so often taught using only 1150 days. Strong’s Hebrew meaning for “time appointed.” Gen 1:14; Dan 8:19. 1. (properly) an appointment, i.e. a fixed time or season. betroth, gather (selves, together), meet (together), set (a time). The exact measurement of time. The seven final cycles of Feasts, i.e. 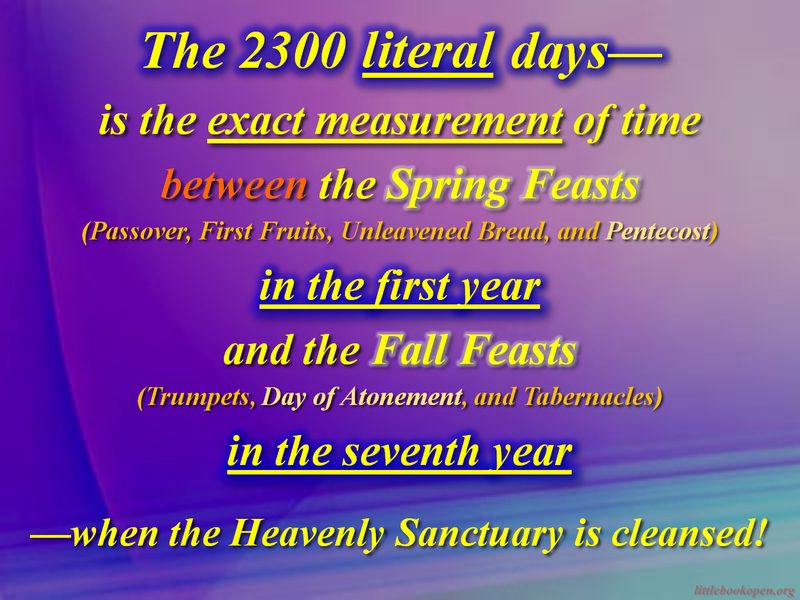 Spring Feasts and Fall Feasts, complete the last extension of Salvation for the last generation. 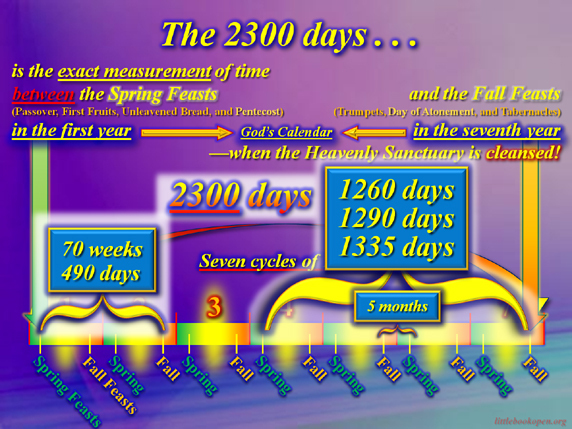 God’s calendar fits exactly into the 2300 days by including seven complete cycles of Spring and Fall Feasts, finishing the work of Salvation for the last generation in the shortest amount of time! 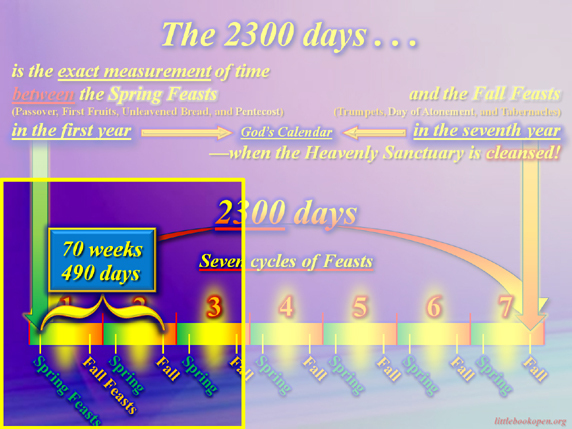 The above chart shows the continuation of the yearly cycles of Spring and Fall Feasts; —year two Spring and Fall, —year three Spring and Fall, and so on for year four, five, six. 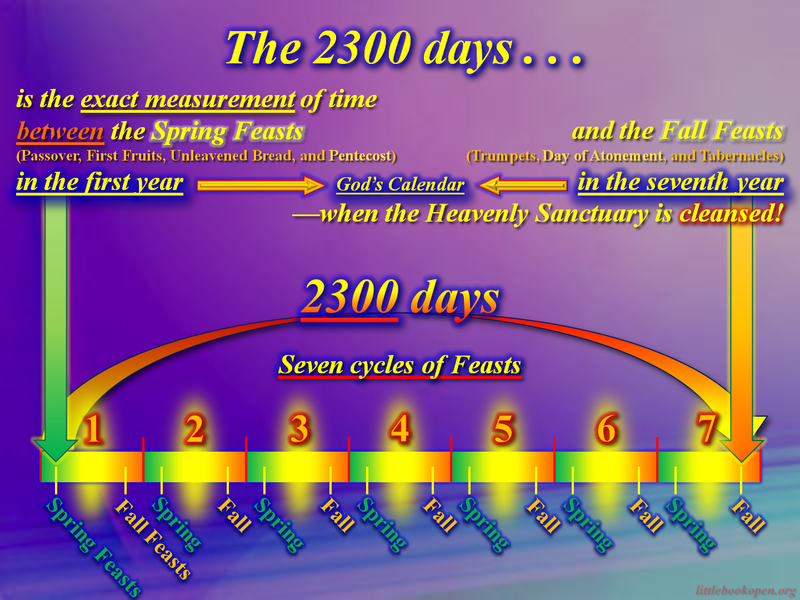 The above chart shows that the seventh year of Feast cycles would, of course, start with the Spring Feasts. 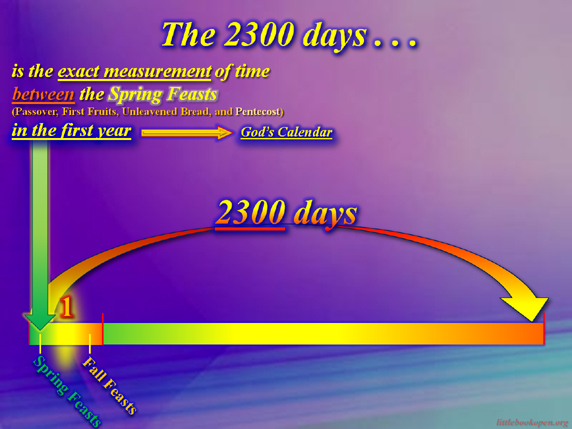 As the days of summer pass into the fulfillment of the Fall Feasts, the 2300 days would be completed to the last day, —ending on a Fall Feast/Fast. Which Fall Feast would that be? —The Day of Atonement! Measurement of appointed times in last days. The above chart shows that the 70 weeks, 490 days, is again to have its fulfillment with Israel, this time with modern Israel. Who is modern Israel? With whom has Jesus entrusted His truth? Has she been faithful to His truths and prophecies, or has she allowed herself to be controlled by the Romans? When she is put to the test, will she again turn against her Saviour? If history is to be repeated, this prophetic timeline will start at the same time as the 2300 days. On which Feast, 490 days later, would it end? 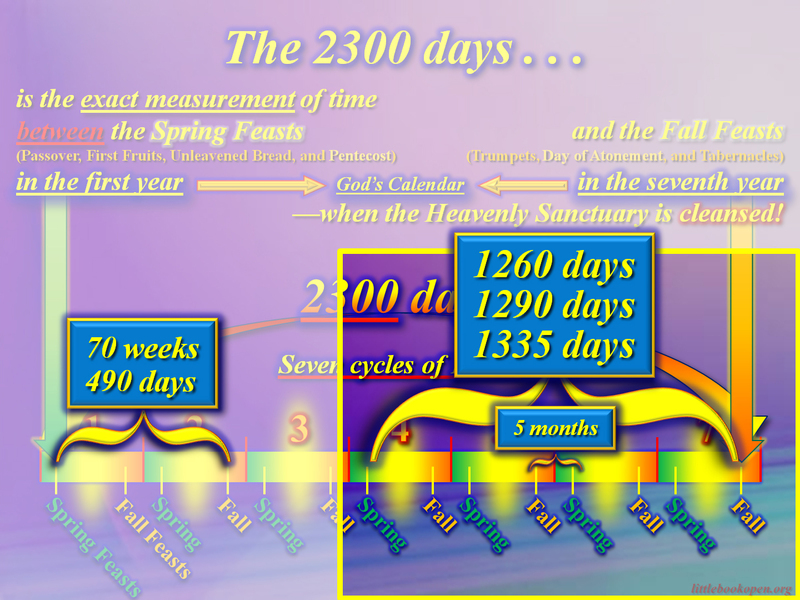 The above chart shows the approximate locations of the 1260 days, 1290 days, and the 1335 days. (Note: The 1260, 1290, and 1335 days are placed together on this chart as inclusive of the three times; which means that this chart does not show their individual Feast fulfillments! (See the Mirror Chart for the proper placement.)) We will better understand these prophetic timelines as we get closer to their fulfillment and the unrolling of the scroll. We may have a lot more to learn about the value of the New Moons; the beginning of God’s sacred calendar and the beginning of each month. Satan has so rearranged the New Moon in the Gregorian calendar so that it has nothing to do with starting a month. Will the New Moons be kept in Heaven? See Ps 81:3, 4; Eze 46:1-3; Amos 8:4-7; Isa 66:23; Rev 22:2. The above chart shows that the times of Daniel may not be the only timelines connected with the Feast Days. It appears that the five months of the fifth trumpet may begin in the Fall Feasts and end in the Spring Feasts. Rev 9:5, 10. Even the ten days of persecution in the Smyrna church may have literal and/or figurative meaning with the Fall Feasts. Rev 2:10. The above chart shows that the Feasts of the Lord will play a major role in the placement and fulfillment of last-day events. But their particular purpose will be the preparation of the saints to live in the sight of a Holy God! The Spring Feasts have had their fulfillment! And the Fall Feasts shall have their fulfillment! I believe this paragraph to be one of the most important explanations of last-day events given to the last generation! The events and times of this paragraph will have their more direct application in the very near future, and will take place among the seven thunders. The process by which Heaven gives truth to man is found in Revelation 1:1. God the Father gives to His Son, Jesus to angel(s), angels to man, and then man to man. Angels play a much larger role than we think! Strong’s Greek meaning for “reed” and “rod”. 12:14 (3½ years); 13:5 (42 months). See also: G58 —See below. 1. To divide or distribute by lot. share to each individual concerned. 3. To grant, as a portion; to give, assign or appoint in general. Let every man be contented with that which providence allots to him. Compare: G2411, G4638 —See below. 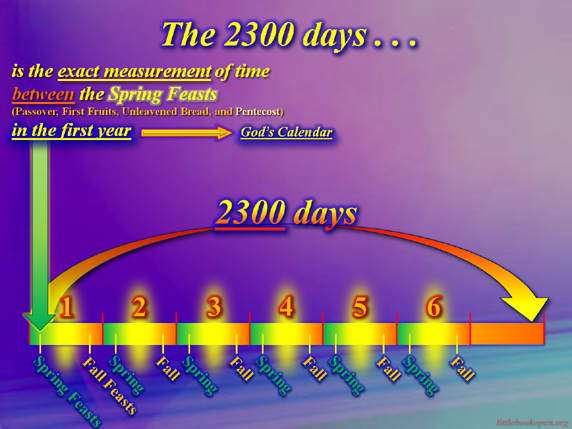 Ancient Israel literally looked out for the New Moon each month and then counted to the Feasts. This is still the best method; for it teaches us to always be ready! Measuring the Heavenly Sanctuary and the altar should be to us —a very personal experience! It is, after all, the ‘altar call’ of salvation! The ability to measure and to respond is gaged by how well we hear the “altar call of the Lamb.” Only by this personal measurement, are we able to truly see ourselves for what we are —full of sin: and then, to be able to measure the fullness of the court and the Altar of the Sacrifice by Christ! Question: Could there be even more to gain from measuring the Temple? Is the altar of sacrifice in the court the only altar in the service of salvation? What of the altar of the Bread and Wine, the study of the Word, in the Holy Place of the Sanctuary? What of the altar of Lights, the Candlestick of personal service to others? What of the altar of Incense and Prayer, where we bow low in worship before the Most Holy Presence of God with our requests? Are not these altars to become the most important part of our daily lives, being justified and sanctified in the Holy Place of the Sanctuary? Have we made the Holy Place of the Heavenly Sanctuary our daily walk with the Master? It is our privilege someday soon, during the last judgment of the living, to measure and be measured in the Most Holy Place of the Heavenly Sanctuary on the last great Day of Atonement. Let us measure the great altar behind the veil, the ark of the covenant (Rev. 11:19), where is seen the measuring rod of the Almighty, —His Law. Do we understand that only those who are fully justified by the Living Sacrifice being made complete in the daily service of our great High Priest, can enter and stand completely sanctified before the throne of a Holy God? What is this measuring? —It is the study of the Plan of Salvation! It is by our measuring and accepting the Plan of Salvation, that we in turn are measured and counted as citizens of the Heavenly Kingdom! The complete Plan of Salvation is illustrated every year by the Feasts of the Lord, of which the seventh-day Sabbath stands at the head. (Lev 23) Every year, we have the privilege to walk through (measure) the Plan of Salvation —by observing the Feasts— with our Sacrifice, our High Priest, our Benefactor (Holy Spirit). Please forgive us as a church, Almighty God, for thinking that your Memorials of Redemption (Feast Days), which so vividly explain the Plan of Salvation through your Son, have been done away with! They have not been done away with! Help us to understand that they are yet to be fulfilled very specifically in the last-day events, and throughout eternity shall we honor Redemption by keeping these Holy Days! Isa 66:23; Zech 14:16-19.